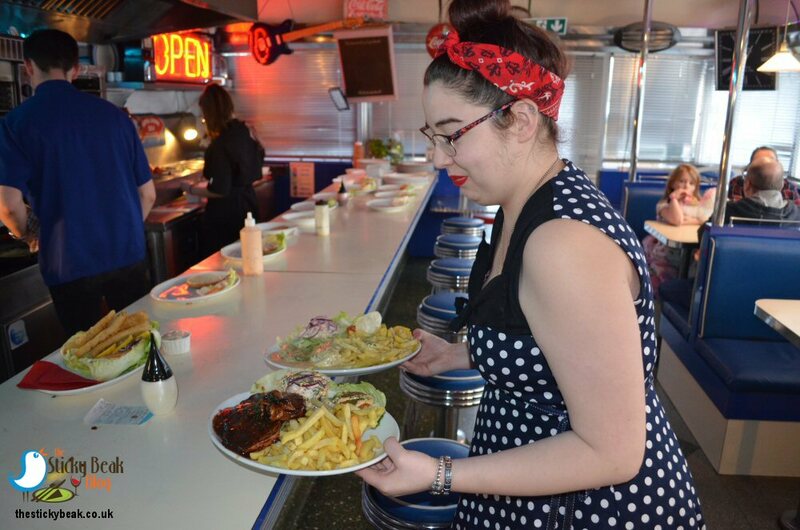 We love visiting different venues, and you’re not going to get more different than The 1950s American Diner at Church Gresley near Swadlincote! This is an actual, bona fide American Diner Car that first traded in Cambridge, Massachusetts, USA on St. Patricks Day, 1950 under the name “Murphys Diner”. 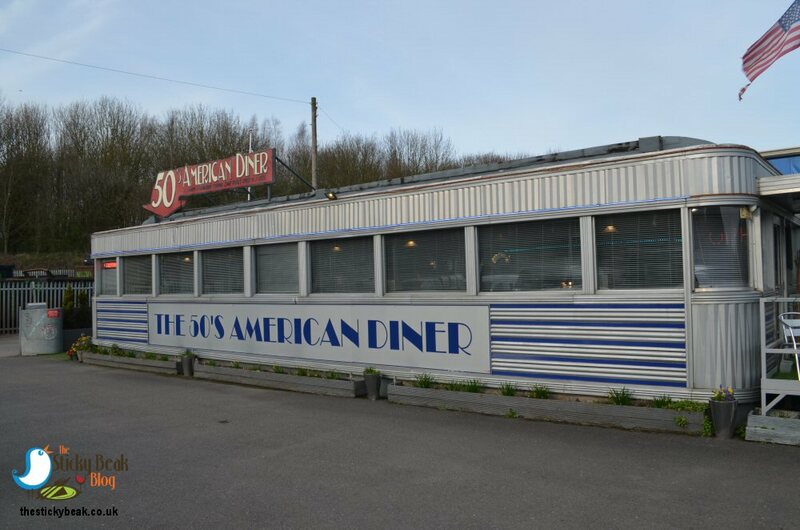 As these things often do, the diner was left to fall to rack and ruin until it was chanced upon by the current owners who shipped it over to the UK and lovingly restored it to its former glory once more. 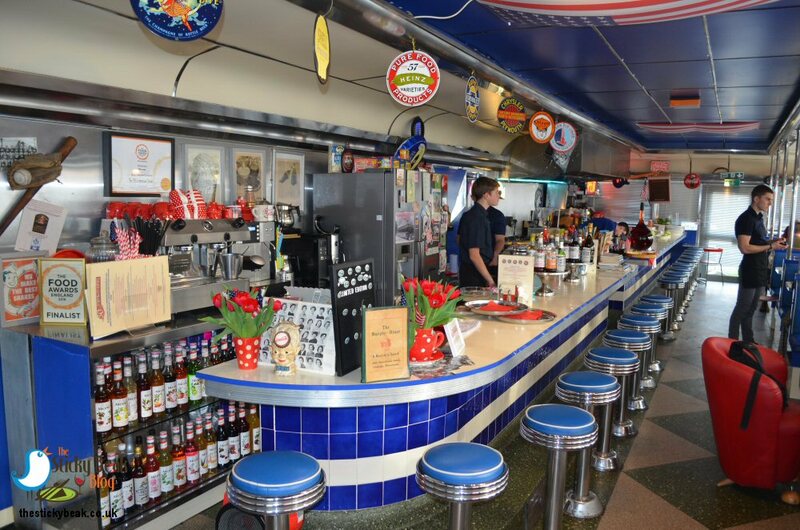 It is Europe’s largest original and oldest 1950’s American diner and represents a real piece of authentic Americana; many of the venues contents are the originals, and as such are irreplaceable. There is a small car park for customers use, and at the far end is a little terrace which would be the perfect al fresco dining spot in warmer months. The music is played outside as well, so you wouldn’t be missing out on any of the ambience. When our jalopy pulled up we could hear one of the songs from the Grease soundtrack, and that’s very much the vibe of this place. 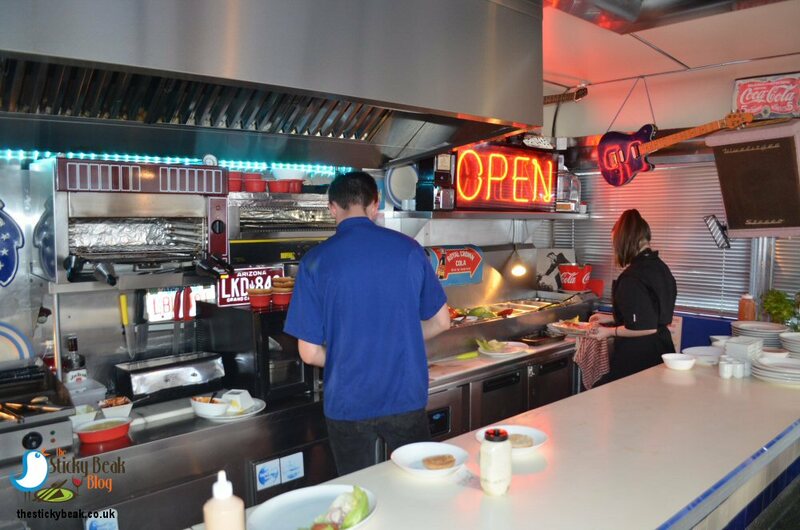 Inside, the diner has a number of booths that seat up to 4 people down one side, and the counter with stools is at the other side. The main kitchen is at the far end, and one thing that really impressed me is the fact that you don’t get any smoke, steam or strong smells wafting through the space. During the 1950’s the prohibition act was still in force in some states, so the diner doesn’t sell alcoholic drinks; however the choice of beverages is so extensive, you really won’t miss it! There are plain sodas, floats (ice cream added to the pop), juices, squash, water, milkshakes, malted milkshakes, Mrs Fitzpatrick’s Temperance bar “tonics”, and a wide selection of teas and coffees – including the ubiquitous “never ending” filter coffee. Phew, that’s some list! Our lovely server, Jack, got our drinks orders sorted quick smart and went off to sort them out: I had a Dr. Pepper float, Chickadee had an Oreo Milkshake, and His Nibs, Mummy Bird, and Daddy Bird all had Root Beers. I first had Dr. Pepper in America in 1982 when I went on holiday there for the first time; I also discovered Sprite and M&M’S, way ahead of their arrival on UK shores. The size of food portions in America is well known to us Brits as being more than generous, so we erred on the side of caution and had a foot-long stack of Onion Rings (known as the Statue of Liberty!) between us 4 adults, and The Chick had a portion of Southern Fried Chicken Tenders with sticky sweet chilli sauce to kick things off. All the food is cooked fresh to order and from where we were sat we could see the dishes being prepared and arranged. Needless to say, our starters arrived piping hot. The Chicken Tenders were, as their name suggests, lovely and tender to eat. The breast meat was nice and juicy, and the coating on them was crunchy, with a fab spicy, peppery hint that got the taste buds attention. 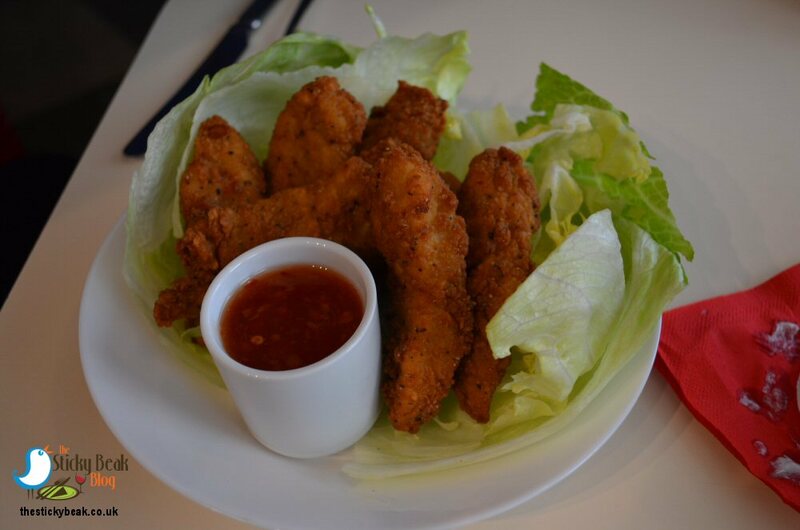 Sweet chilli sauce complimented the tenders really nicely, and crunchy Iceberg Lettuce leaves had cleverly been used to form a bed in which it all nestled. Mummy Bird and I pinched a few of the lettuce leaves to munch on and they were gorgeously crisp and cool in the mouth. 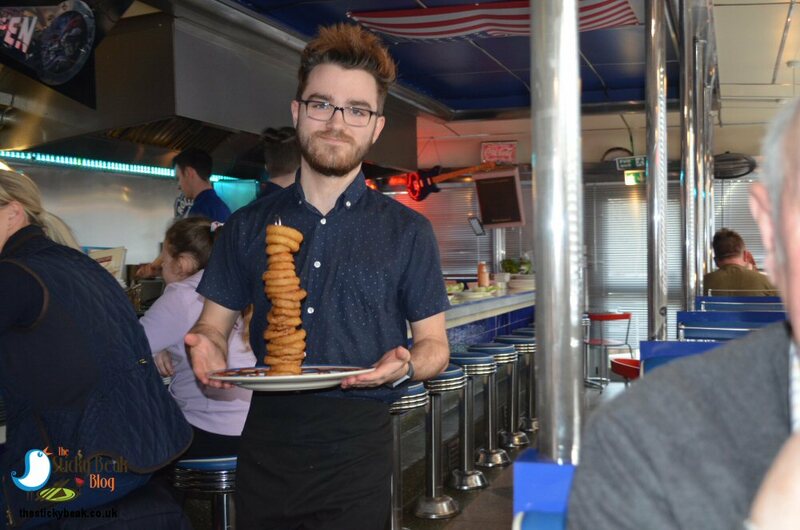 The stack of Onion rings was impressive to behold as it was placed in the middle of the table! A piquant BBQ sauce had been piped in a lattice pattern on the serving plate, and the metal ring holder sat in the middle bearing the golden toned onion morsels. The batter had a super crunch to it and wasn’t at all greasy – needless to say, they didn’t last long! 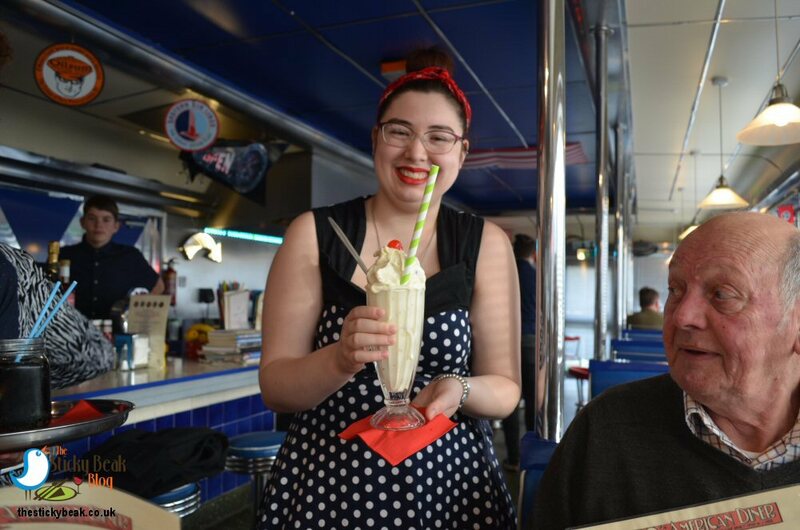 One of the features of the 1950’s American Diner is the uniform the staff wears: male members are attired in smart black trousers with fitted black, collared shirts, and the gals don frilly petticoats and flared dresses and skirts in bright colours and patterns. Along with the music and setting, the dress transports you back in time and you get a truly authentic dining experience of this era. The friendly, welcoming atmosphere meant that there were customers of all ages there, from small children, teens, young adults, older adults, and fossils (that’ll be The Tribal Elders ;)!!). You can reserve the booths for dining, but the team also have the bar area stools kept purely for walk-in guests, so no-one gets left out. For mains we had the whole battered Cod Goujons with Tartare sauce and Mash, the Bobby Darrin burger with fries, Chicken Oregano with Fries (you can choose mash and salad garnish with any meal too, instead of fries, by the way), Good Ol’ Maine Meat Loaf served with Creamed Sweetcorn, and a whole Rack of the diners’ juicy, sticky baby Ribs. Again, all the food is cooked fresh for you, which as it got busier meant there was a longer time to wait; let’s face it though, we’d all rather wait and have our food hot, no? Chickadees Cod Goujons were massive! The fish strips were wonderfully succulent and moist and had a nice natural sweetness to them when bitten into. Crispy batter gave a fab crunch as she chomped away on it, grinning happily as she did so. The Tartare sauce had a nice texture to it, lightly chunky, and had that piquancy to it that lifts things in the mouth. 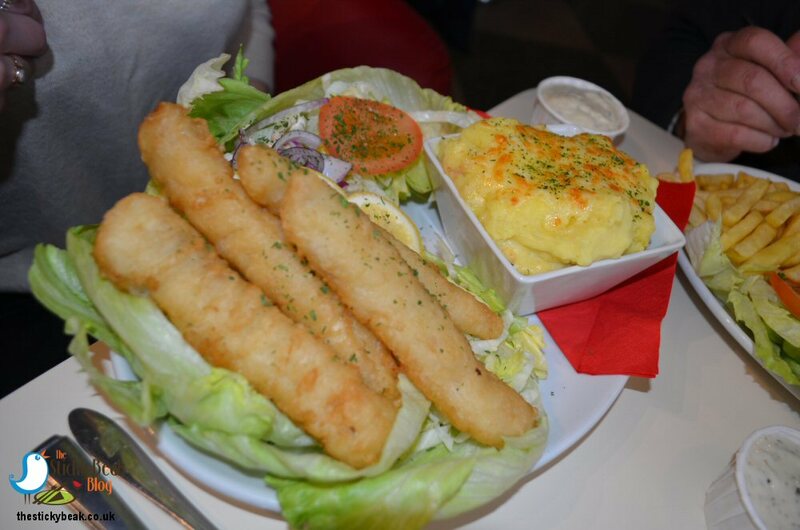 It was the mashed potato that stole the show though! A separate square dish housed the smoother-than –glass, seasoned mash, and it had a fab melted cheese crust that had a good flavour to it. Top marks from The Chick for this meal. Daddy Bird had also gone for fish as his main course; his though came in the form of a burger. 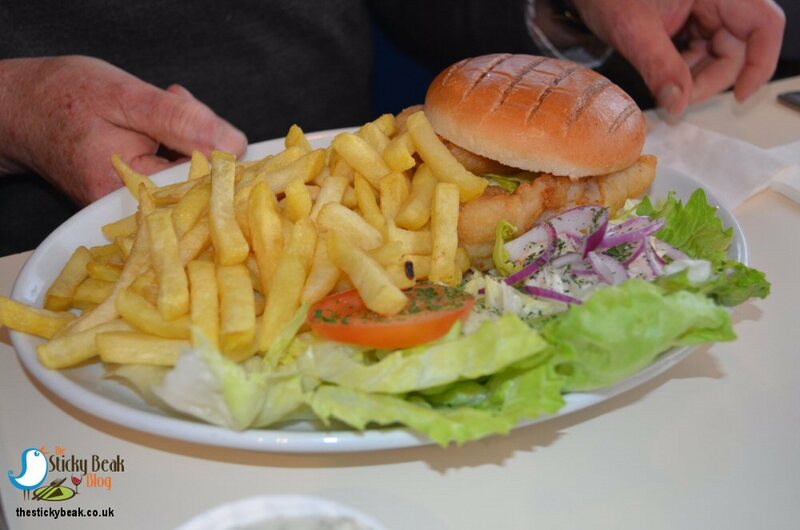 The crispy-battered 100% Cod fillet was housed in a toasted Brioche bun and a generous side salad comes with this (you can choose a dressing for your salad or keep it plain). Golden French fries also came with his meal and let’s just say that there were enough of these to feed a small army! When asked for his opinion, Daddy Bird just beamed at me and said “spot on!”; another satisfied customer. My Mummy had gone for the Oregano Chicken; a whole Chicken breast cooked in a Garlic, Cheese and Oregano sauce – again she’d opted for fries rather than mash with this dish (although she did keep dibbing into Chick’s mash!). The Chicken was beautifully juicy and what can be said about the sauce but “wow”; a fusion of herby creaminess with just a soupcon of garlic, and a hint of cheese right at the end. Both Mummy Bird and I love our salad, so she waded her way through the abundance of lettuce, tomato, red onion, and coleslaw.... then she proceeded to wolf down all her fries! Seriously, even His Nibs and I didn’t manage to finish our meals. I wouldn’t mind but she’s only about 7lbs wet through; well ok, maybe a bit more than 7lb but, you know, turns sideways and you can’t see her kind of thing! Me, I only have to look at food and I gain 2” on each thigh *sigh*. 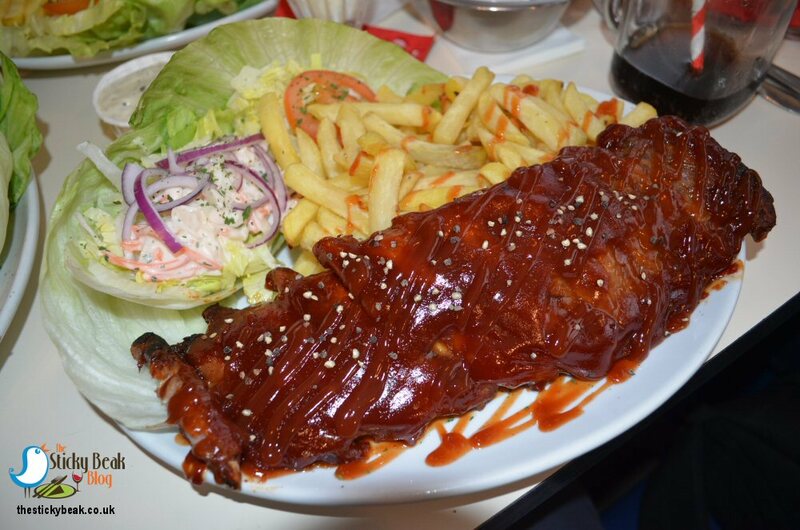 His Nibs’ ribs were everything you want in this dish; sweet, tangy, sticky sauce paired with falling-off-the-bone ribs. Thoughtfully, Jake had brought out a bowl for the bones to go in and several of those fab lemony wet-wipe things. I did manage to beg a bite of the meat and it was just amazing; I’d been tempted to go for the rib/wing combo but the meatloaf sucker-punched me into choosing it. As I’ve just mentioned, I’d gone for the homemade meatloaf, and I wasn’t disappointed in my choice when it arrived in front of me. Thick slices of bacon-wrapped, dense textured meatloaf had been partnered with thick spiced/seasoned saucy gravy and the aroma made my mouth water – and that was before I even took my first mouthful! The finely ground meat was really, really tasty and had been nicely seasoned so that it had a gentle spiciness to it. The creamed Sweetcorn was in a separate little pot and that was cooked down slightly to mush some of it up a little and herbs were scattered in there too, to zhuzh it up a bit. I’d gone for the Thousand Island dressing on my salad and this was lovely and piquant. I can’t tell you the last time I had this dressing, but I remember how much I used to love it; guess what’s gone on my shopping list?! At this point Chickadee left us – typical teen; places to go, people to see! Initially we weren’t going to have pudding but the will-power slowly evaporated from us, one by one. Daddy Bird and I both ordered Just Peachy, Mummy Bird had her favourite – Pecan pie-, and The Man Bird had the Gingerbread pudding. You can choose to have Ice Cream or Cream or Custard, depending on which desserts you choose from the menu. The Pecan pie filling was that beautiful deep brown colour with a lovely rich taste to match. 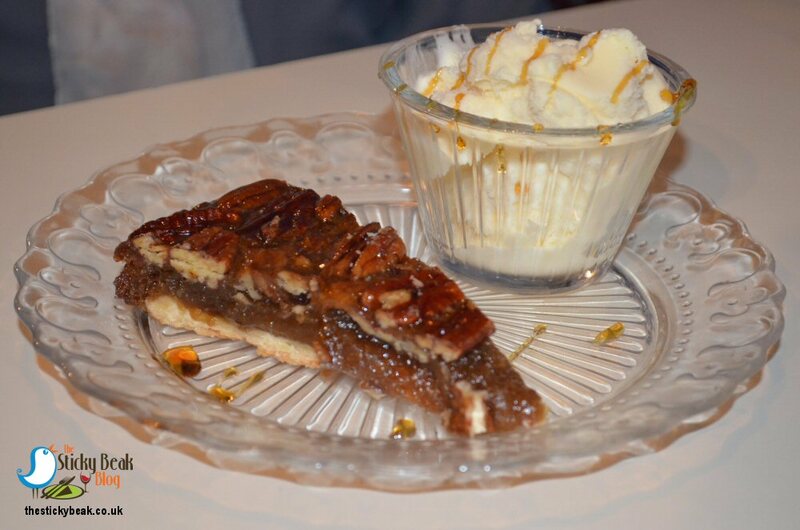 Loads of crunchy Pecan halves lay on top, imparting their unique flavour to the dessert, and a gorgeous buttery pastry base completed the picture. Mummy Bird had opted for Ice Cream, which flummoxed me somewhat as I would’ve bet my last dollar on her choosing pouring cream! Daddy Bird and I were more than happy with our Just Peachy choices, they were, well, just peachy! 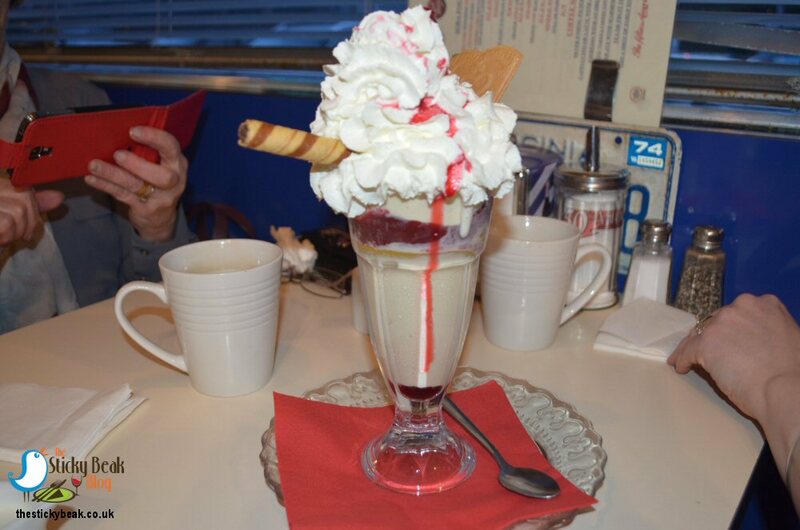 This stunner came in a Knickerbocker type glass and consisted of layers of Vanilla Ice Cream, juicy Peach slices, and whole Raspberries, that were then topped with a generous blanket of fresh whipped cream, wafers and a Chocolate centred ”straw” wafer. The fruit flavours were really zingy and vibrant, making this a superb end to a meal; the Raspberry coulis in particular was that curious sweet-but-tart taste that makes you scrunch up your face when you first taste it. Even better, it didn’t lay heavy on our tummies! 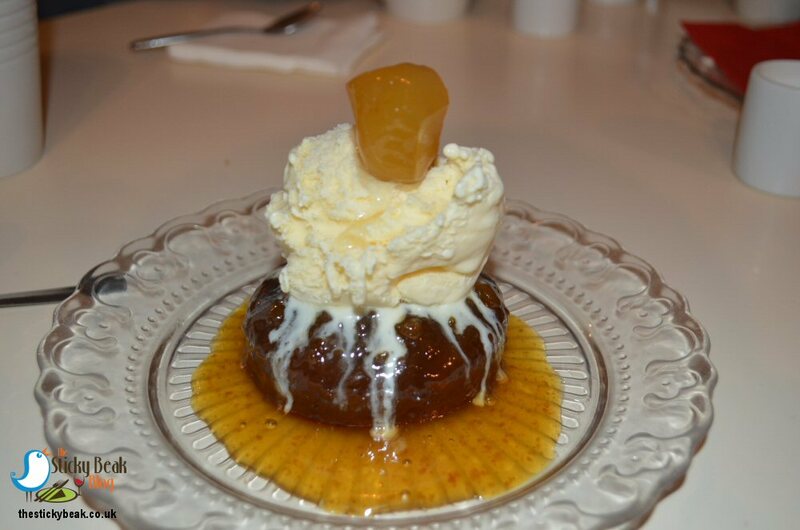 The Man Bird’s Gingerbread pudding was a proper bobby dazzler. The sponge was nice and light in texture, with a delicate Ginger taste; the Ginger sauce that partnered it was a lot more robust, and the warming Ginger taste came bowling through in a kind of “ta-dah! !” style on the palate. A generous scoop of Vanilla Ice Cream crowned the pudding and a sphere of Crystallised Ginger finished it off nicely. This was another clean tasting pud that brought His Nibs’ meal to a glorious conclusion. Price-wise, we had no complaints either; the total bill for the five of us (and I’d had an extra float, and we all had coffees) came to a very reasonable £115, and we didn’t exactly skimp. Jake brought the bill over and a tray of kitsch sweeties for us all to have a dib into – I took a tube of lovehearts back for my Chick and had a fruit chew for myself. 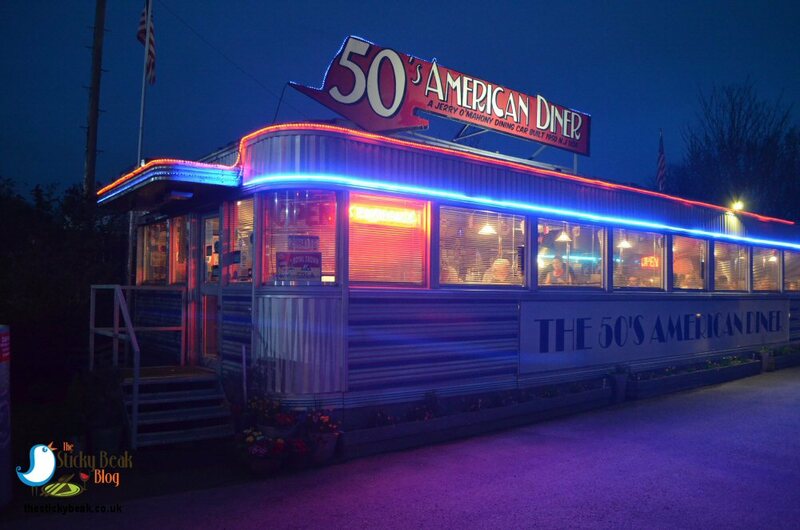 The only down side to the 1950’s American Diner is that it is only open 3 days a week. It is closed Monday-Thursday, opens 5pm-9pm on Fridays, Noon-9pm on Saturdays, and Noon -7pm on Sundays. 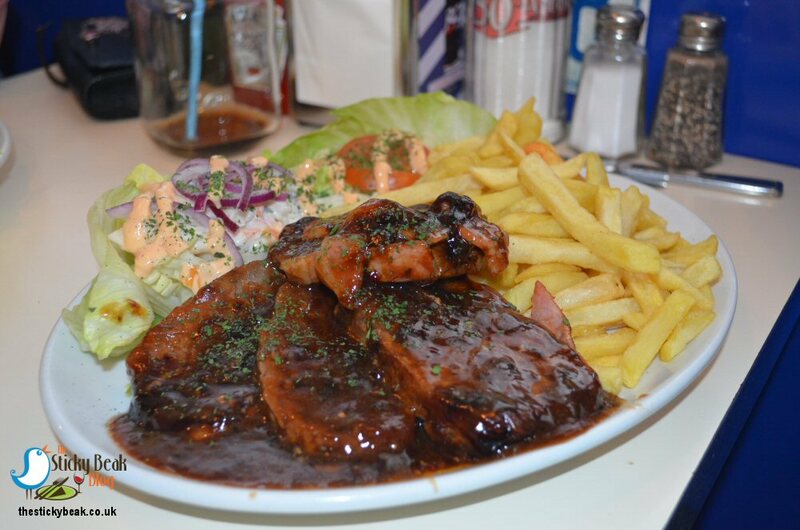 Booths are bookable, but only by telephoning 01283 220050; leave a voice message and they will call you back. We had a fab time, all 3 generations of the Flock, and I’m sure you will too! Hot Wings definitely deserved at this quirky, unique venue.